Ever find yourself with the urge to read but with no inspiration? Unleash the bookworm! Long-haul travel is a great opportunity to get stuck into a good book or two, especially after witnessing the mediocrity of some in-flight entertainment offerings (Jack Reacher wannabe Tom Cruise, I’m a-lookin’ at you). So in the last 7 days I finished two excellent classics which I had long intended on reading but just never got round to. Jack London’s The Call of the Wild is the short but epic tale of the gradual return of dog to nature at the turn of the 20th century under the “law of club and fang”. It’s the story of Buck, stolen from the sun of California to pull sleds in the deep North. Set in the cold wilderness of the Yukon during the gold rush, it paints with brutal honesty and poetic brilliance the brutal rule of man over beast, the fight for survival under the harsh rule of nature and the awe-inducing majesty of frozen forests, lakes, valleys and skies. “And when, on the still cold nights, he pointed his nose at a star and howled long and wolflike, it was his ancestors, dead and dust, pointing nose at star and howling down through the centuries and through him.” London, J. The Call of the Wild, 1974. p40. Scholastic Book Services, USA. 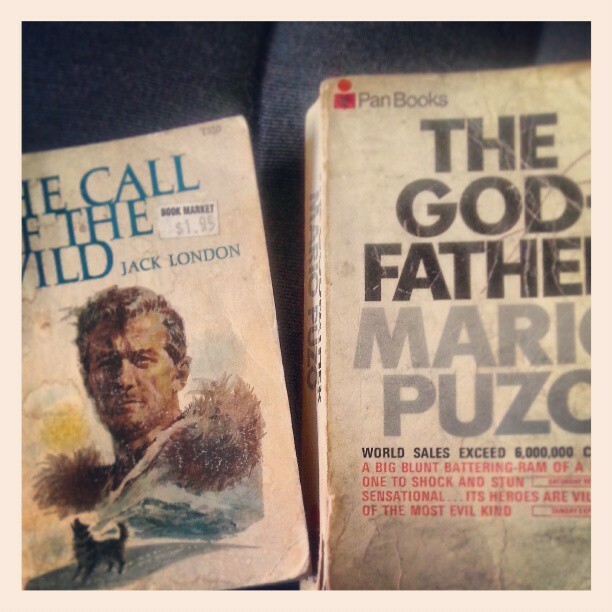 Everybody knows Mario Puzo’s The Godfather. Most people will have seen the epic trilogy. I will admit that for a number of reasons, I have not. Yet. I did however want to read the book first and now that’s done and I’m glad I waited. The underbelly story of cunning brilliance and life or death political string-pulling over the course of a decade is one I won’t recount here. But I will comment on the writing. Fast, furious, dirty, blunt, this riotous reflection on violence and justice in society sometimes lacks the ability to stay silent for a while and let the reader take stock. It’s a breathless, exhausting but brilliant page turner is one that I can only imagine enhanced by the touch of Hollywood and the big screen. I can’t wait to compare. “They were men who guarded their free will with wiles and murder. Their wills could be subverted only by death. Or the utmost reasonableness.” Puzo, M. The Godfather, 1970. p289. Pan Books Ltd, London.